atrium and pumps it out into the arteries. The openings between the chambers on each side of the heart are separated by flaps of tissue that act as valves to prevent backward flow of blood. The valve on the right has three flaps, or cusps, and is called the tricuspid valve. The valve on the left has two flaps and is called the mitral, or bicuspid, valve. The outlets of the ventricles are supplied with similar valves. In the right ventricle, the pulmonary valve is at the origin of the pulmonary artery. In the left ventricle, the aortic valve is at the origin of the aorta. See figure 1-33 for valve locations. The heart muscle, the myocardium, is striated like the skeletal muscles of the body, but involuntary in action, like the smooth muscles. The walls of the atria are thin with relatively little muscle fiber because the blood flows from the atria to the ventricles under low pressure. However, the walls of the ventricles, which comprise the bulk of the heart, are thick and muscular. The wall of the left ventricle is considerably thicker than that of the right, because more force is required to pump the blood into distant or outlying locations of the circulatory system than into the lungs located only a short distance from the heart. 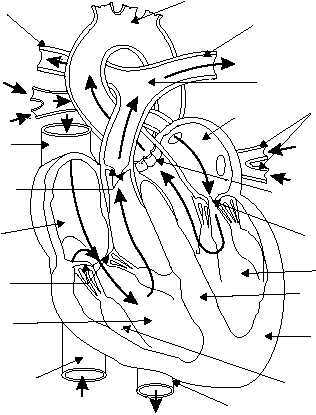 Heart Functions The heart acts as four interrelated pumps. The right atrium receives deoxygenated blood from the body via the superior and inferior vena cava. It pumps the deoxygenated blood through the tricuspid valve to the right ventricle. The right ventricle pumps the blood past the pulmonary valve through the pulmonary artery to the lungs, where it is oxygenated. The left atrium receives the oxygenated blood from the lungs through four pulmonary veins and pumps it to the left ventricle past the mitral valve. The left ventricle pumps the blood to all areas of the body via the aortic valve and the aorta. The heart's constant contracting and relaxing forces blood into the arteries. Each contraction is followed by limited relaxation or dilation. Cardiac muscle never completely relaxes: It always maintains a degree of tone. Contraction of the heart is called systole or the period of work. Relaxation of the heart is called diastole or the period of rest. A complete cardiac cycle is the time from onset of one contraction, or heart beat, to the onset of the next. 1-26 AORTIC ARCH LEFT PULMONARY ARTERY RIGHT PULMONARY ARTERY PULMONARY TRUNK BRANCHES OF LEFT PULMONARY VEIN AORTIC SEMILUNAR VALVE MITRAL VALVE LEFT VENTRICLE INTERVENTRICULAR SEPTUM MYOCARDIUM (HEART MUSCLE) PAPILARY MUSCLE DESCENDING AORTA INFERIOR VENA CAVA (FROM TRUNK AND LEGS) RIGHT VENTRICLE TRICUSPID VALVE RIGHT ATRIUM PULMONARY SEMILUNAR VALVE SUPERIOR VENA CAVA (FROM HEAD AND ARM) FROM LUNG FROM LUNG TO LUNG TO LUNG LEFT ATRIUM HM3F0133 Figure 1-33.Frontal view of the heartarrows indicate blood flow.